ShammingSituation: Book review of The Colours Of Passion-unravelling dark secrets behind the limelight. Book review of The Colours Of Passion-unravelling dark secrets behind the limelight. Hardly I come across authors who write such amazing thrillers with two of my fav genres infused in a single book. I have been a fan of Sourabh Mukherjee's murder thrillers' and I look forward to read his books every time. 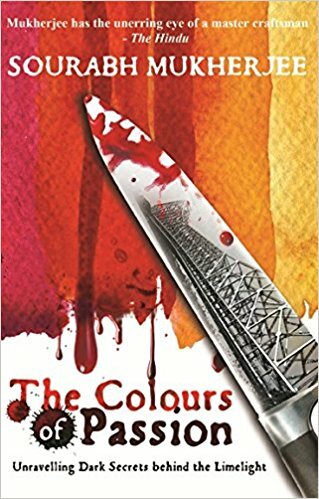 The colour of passion 'as shown in the cover' depicts the colour red as it signifies revenge and love too. when I started reading it since the very first page I knew it would very easy for me to find the murdered but as expected I was wrong, since the very first page you will start guessing about the murderer and u will surely doubt each and every character and still you will fail to predict the ending. The writing is crisp, lucid and amazingly captivating, you won't be ale to keep the book down till the time you complete it. The editing is just flawless, from the cover to the blurb, everything is just good, I couldn't find any single flaw that can disappoint any reader. This book can be easily awarded as the best murder thriller of the year.